Summary: A little lion cub just wants to find someone to play with but all the animals get scared away. A cute animal counting book that young children will enjoy. We pulled out our letter stamps this week. I printed off an outline of the letter L and had my daughter stamp with the letter L stamp. While she was stamping we named words that began with L: ladybug, little, lion, loud, listen, lollipop, land, like, etc. Our jungle animals have been used often. We didn’t have all the exact animals from the book, but my 2yr. old pretended she was the little lion cub and she “roared” at the animals asking them to play. We also practiced counting using the animals. We made a lion craft out of craft foam. First find a medium-sized lid and trace onto light brown craft foam. Next cut a slightly larger jagged-sun shape on dark brown craft foam for the mane. Then cut two ears from the light brown craft foam and a rounded triangle from the dark brown craft foam for the nose. Glue all the pieces together. Add google eyes and use a Sharpie pen to make the mouth and whiskers. You can place this on a craft stick to be a puppet, or add magnets to the back. We used it to retell parts of the story. 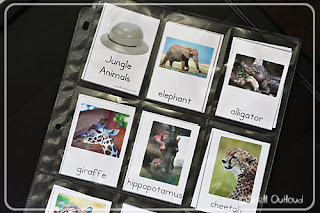 Next I pulled out some learning activities from a wildlife kit I purchased from Time for Tots. The mat had photos of various animals and my daughter had to match the pattern sticks to the animal that had that pattern. The lion letter craft from Jolanthe would go perfectly with this unit. You can find this download under Letter J activities. Lion Mini-Puzzle, Handwriting/poem and coloring sheet found under Letter L activities.